I'm extremely happy with my Dr. Shin? he is Professional, understanding and taking his time while explaining all about myselfin this case. I felt that Dr. Shin is very caring person and Awsome human being, I will always recommend his clinic to my friends and family! And for my dear Doctor Shin I will many more successful years to come! We All Need Doctors like you? I'm extremely happy with my Dr. Shin? he is Professional, understanding and taking his time while explaining all about myself in this case. I felt that Dr. Shin is very caringperson and Awsome human being, I will always recommend his clinic to my friends and family! And for my dear Doctor Shin I will many more successful years to come! We All Need Doctors like you? 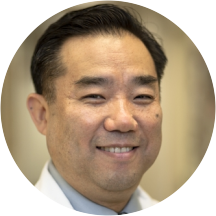 Dr. Hyunki Shin specializes in obstetrics & gynecology in Fairfax, Virginia. Dr. Shin attended medical school at Texas Tech University Health Sciences Center School of Medicine and graduated in 1991 having 22 years experience. Dr. Shin takes great pride in giving the best care to his patients. Welcome to our Obstetrics and Gynecology practice in Merrifield! Dr. Shin is amazing! He is honest and has your best interest at heart. He was great and informed me along the way on what to expect. Was supposed to have a call back within 48 hours from a blood test, I even called the office and was told I would get a call back. Never did, changing doctors. I feel like I was not taken seriously during the appt, not something Id like to feel. Amazing doctor! Dr. Shin knows how to treat his patients. He goes everything with you to make sure you understand youre on the right page. He will answer all the questions you have with explanations that are easy to understand and recommends treatment that's right for you. Dr. Shin was such a joy to have as a provider. He was very informative and kind. I was nervous about a few things but he educated me and reassured me that I was in great care and indeed I was.I highly recommend Dr. Shin! The whole staff was kind and sweet and not too many professionals are that way daily. It was a pleasure visiting and I miss them and hope to use them again if I get blessed again to have another baby! I have been going to Dr. Shin for about 2 years now. He is one of the best doctors I have been to in my 29 years. He was the only doctor to not only diagnose but treat me for something I dealt with for years. He's awesome gyn. One of the best I ever had. Loved each visit throughout my pregnancy. I saw Dr. Shin a few months ago regarding my future pregnancy and fears of infertility. He was very dismissive of my concerns and made me feel as if they were not important / valid. He forced a lot of hisown personal/cultural judgement and not one of a medical professional. I left crying - I would go as far as to say my time with him was pretty traumatic. I would not recommend him. His bedside manner was slightly condescending, and several times I was made to feel like I didnt know my own mind. It's virtually impossible to get in touch with this clinic over the phone. I was told that I would need to receive "additional information" on how to take a medication. I requested to be given this information over the phone but he required me to come in for instructions. During this follow-up appointment hecovered the exact same information that he already provided at my initial appointment. When I asked what "additional" info he needed to share that required me to come in he just said something like-- this is it, it's just that 'all of you' tend to forget and end up calling me to ask questions. Unhappy with his condescending remarks, I gathered my things and refused to pay the copay for the visit. This was the final straw for me, I never felt at ease or comfortable in his office and did not agree with his aggressive approach to fertility discussions. Dr. Hyunki Shin is very personable and attentive. I am so so happy with him and his services. He answered all my questions diligently and made me very comfortable sharing my concerns with him. Loved his attitude and will be returning back. It's rare to actually meet with the Doctor of a practice that has his name on it. In any case, Dr. Shin was wonderful. I told him about the issues I've dealt with at two prior OBGYN clinics and he...just likeme...thought they hadn't done all they could to help me. He was funny and kind and very thorough. I would recommend him again. Dr Shin was courteous and direct. I found his staff was very friendly. I have had bad experiences with this kind of doctor and my heart was pounding the whole time; for my first visit they made the appointment as comfortableas possible. I would also recommend this doctor for anyone who has gone through trauma and is a little skittish. He keeps a nurse in the room through the examination for assistance and mutual comfort. Honestly, i appreciate it. The doctor gave me a sense of hope and respect. I hope all other doctors are like him. The entire staff in the hospital are awesome and respectful. Dr. Shin was very personable and made me feel comfortable the whole visit. I felt like he was really trying to get to know me as a new patient and he was very sincere! The visit was great! I was impressed by the office service. They called me earlier to let me know the doctor was gonna be late because of an emergency operation that he had to perform which I greatly appreciated. However itcould have been better if the office staff were more friendly or warmer. They seemed to be a bit stand off ish or disengaged. My first time seeing Dr. Shin and he was friendly, personable, and open. I will definitely be going back to see him again, highly recommended. the best! he is such a good doctor! He is very patient, professional and funny. In my case, I had a hard time to do vaginal delivery but he put all the effort to make it happens which I finally did. Great doctor. Explains everything in a detail manner. Dr. Shin and his staff are wonderful! They are very professional, kind, and knowledgeable. I really dislike visiting the Doctor; however, I actually look forward to my appointments with Dr. Shin. I had a c-section with Dr. Shin, and the entiresurgery was fine! It was quick, painless, and, most importantly, without complications! Following my labor, I decided to make Dr. Shin my primary OBGYN so; now, I am seeing him for annual appointments and mammograms as well. It goes without saying that if I have another baby, Dr. Shin will be delivering that one too! I am a difficult person to please, but I am immensely pleased with Dr. Shin and his office staff. I would highly recommend Dr. Shin! Have been going to Dr. Shin for the past few years and he and his staff make the visit about as comfortable as visiting your OBGyn can be :) I highly recommend him! He is very good. Highly recommend. Very nice and thorough during the examination. Would recommend to anyone! Dr. Shin is great! The office is small and dirty. The staff is terrible, the nurse and receptionist seem like they hate their jobs. Extremely kind and professional. Felt very comfortable with him and the entire staff. Such a positive experience! Excellent Dr who is thoughtful and patient. Highly recommend Dr. Shin. The visit went very well. Dr. Shin was pleasant and patient. Also it was the most comfortable pap smear I have ever had! He's a wonderful obgyn! He has great staff. Overall I was very please with him through my 9 months of being pregnant all the way to post baby! Very humble down to earth and make sure he keeps his patients at ease! It was wonderful Dr Hyunki shin and all his staff was very lovely and helpful and also very polite. This was my first visit but because I'm a little behind with my check ups , he was thoughtful and help mewith a lot of things at once that could have been done in 3rd or 4th appointment and I appreciated that so thank u so much to all. I highly recommend Dr Hyunki because he is very humble and caring and helpful.